I put this on top of Rimmel Venus. The last four photos are taken with the flash and the end photo has a top coat on it! This is easy to use and easy to apply. All you need to do is sprinkle the glitter over a wet nail. I tend to use a top coat then quickly sprinkle the glitter over it, then tap the excess off. Make sure you've got a little tub underneath to catch the glitter and then you can put the leftovers back into the bottle! I put a top coat over this (last photo) - the holo glittery bits did still show. Lasted well. not sure about the base color, but that glitter!! bling bling bling!! 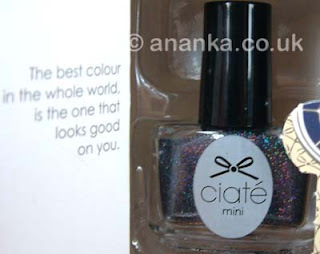 Another beautiful colour from Ciate. Very festive looking! I have a similar nail polish from Sally Hansen - not a glitter but a clear nail polish with glitter very similar to this one. It's Glitz Gal. What a beautiful holo glitter <3. It's a really pretty glitter with a lovely holo effect! I'm in a christmas mood - glitter! Wow! So shiny, love it!